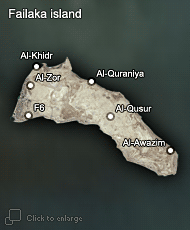 Al-Quraniya is a mound around 550 m long and 250 m wide running along the north shore in the west-central part of Failaka. With an elevation of around 6 – 8 m a.s.l., it is one of the highest spots on the island overlooking a large portion of the north coast and the sea towards the mainland. Al-Quraniya as a deserted village and archaeological site is known since the 18th century. An Italian mission in the 1970s dated the site from the 11th to 17th centuries, with the possibility of shifting its beginnings back to the earlier period. The architectural remains of Al-Quraniya village are spread all over the flat mound top. The surface of the site is covered with sherds and other artefacts associated with habitation. Three anchorages are situated to the north of the village and some 450 m southeast of it is a square fortlet. This was built from sea-rock in square-like layout with round protruding corner towers. The fort was dated to the 16th – 17th century. From the point of view of the origin of this type of ground plan, it is more likely that the fort represents typical Arab fortification rather than a Portuguese defensive structure. In 2006, 2007, 2008, and 2009 the site was mapped and surveyed by KSAM. The main goal of survey and mapping of Al-Quraniya village was to work out a detailed digital model capturing geography and visible architectural remains. Geophysical prospecting of the whole site was carried out by GPR from 2007 to 2009.